GE is starting to look a lot like Boeing did two years ago. It faces real challenges, but too many investors are overlooking its strengths. Shares of General Electric (NYSE:GE) have lost half of their value over the past 12 months. Nevertheless, analysts at several prominent investment banks think the stock could continue sliding, as highlighted by last week's Barron's cover story. The bearish analysts point to falling sales for one of GE's most profitable product lines, high pension liabilities, "black-box" accounting practices, and a new SEC probe (among other things) as reasons for caution. However, many of the same things were said about Boeing (NYSE:BA) just two years ago. Yet Boeing stock has tripled since then. Boeing Stock Performance, data by YCharts. 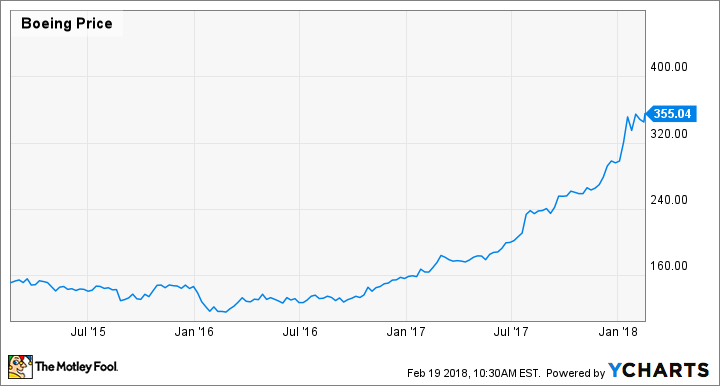 GE stock doesn't have 200% upside today, but it appears to be significantly undervalued for many of the same reasons Boeing stock was beaten-down two years ago. If GE can successfully execute its strategy to simplify the company and stabilize the power business, the stock could recover much of its losses from the past year by 2020. Boeing's 2015-2016 stock swoon was caused by several factors. The biggest was a slowdown in orders for the company's highly profitable 777 jet. As a result, some analysts worried that Boeing would need to cut production significantly, undermining its revenue, earnings, and cash flow. Around the same time, other analysts became increasingly worried about the profitability of the 787 Dreamliner aircraft program. Many believed that Boeing's use of program accounting was covering up big losses on Dreamliner production that would never be recovered. These concerns even sparked an SEC investigation. Adding to the pressure, Boeing continued to face a roughly $20 billion pension deficit, second only to GE among large U.S. companies. The interesting thing about Boeing stock's recovery is that many of the analysts' warnings a few years ago were justified. Boeing has slashed the 777 production rate from 8.3 per month back in 2016 to just five per month today -- and the rate of deliveries to customers is even lower, at about 3.5 per month. Furthermore, Boeing is still more than $20 billion short of recouping the losses it incurred building the first several hundred 787 Dreamliners. But on the flip side, the profitability of Dreamliner production has improved dramatically, and there is a clear path to additional improvement. Meanwhile, Boeing is steadily increasing production of its highly profitable 737 family of jets. The result has been a surge in cash flow, as the strongest parts of Boeing's business have more than made up for its weak links. Rising 737 production is boosting profit at Boeing -- and at GE Aviation. Image source: Boeing. Like Boeing two years ago, General Electric today has some strong franchises that investors are overlooking because of problems elsewhere in the business. As was the case at Boeing, most of these issues are likely to prove ephemeral -- or are already priced into GE stock. For example, GE's $31 billion pension liability (as of the end of 2016) isn't nearly as scary as it looks. GE plans to make a $6 billion debt-funded pension contribution this year. Furthermore, the company disclosed in its 2016 annual report that a 25-basis-point increase in the discount rate would reduce its pension obligation by $2.2 billion. Long-term interest rates have increased by about 25 basis points just in the past month. Indeed, rising interest rates could easily knock $10 billion off of GE's pension obligation by 2020. The GE Power business -- one of General Electric's three core business units -- is a bigger concern. GE was caught flat-footed in the past year or so as renewable energy undermined demand for gas turbines. As a result, management expects GE Power's segment profit to fall from $5 billion in 2016 to around $3 billion in 2018. On the bright side, GE should be able to stabilize the power business by cutting costs. This would improve its profit margin and cash flow, even if the revenue environment remains weak. Meanwhile, GE's aviation and healthcare businesses remain solid performers in secular growth industries. GE Aviation is by far the conglomerate's most valuable business. As the largest jet engine manufacturer, it is benefiting from the same long-term demand growth as Boeing. Indeed, segment profit is likely to grow at a high-single-digit rate for a decade or more. Critics aren't wrong about the weak outlook for GE Power or the complexity of the company's finances. However, they are underestimating General Electric's ability to address those issues -- and ignoring the considerable strength of GE's aviation and healthcare franchises. During the next two or three years, General Electric is likely to sell or spin off numerous smaller business lines in order to raise cash and simplify the company. It will also work to cut costs in the power business and reduce corporate overhead. Meanwhile, the aviation and healthcare segments are set to continue their steady growth. As a result, GE is likely to produce higher earnings and have a clearer path to future earnings growth by 2020. This should help the stock rebound -- just as Boeing shares have in the past two years.